Cities across the world celebrate Mardi Gras with colorful parades and over-the-top parties. Then Ash Wednesday arrives … Sigh. Lent has begun. You hear about devout friends giving up seemingly innocent things like chocolate or stressing out as they try to live a more perfect life during six grueling weeks—for reasons you don't completely understand. Sermons about penitence are preached, and guilt soaks the congregation. Sound like a good time?! It's time to rethink Lent. Or at least see it for the positive opportunity it offers. It's spring cleaning for the soul! Lent offers you time to pause, consider, and renew your relationship with God—an altogether hopeful (not dreary) experience. "To arrive at newness of life, we first name parts of our lives that are shrouded in darkness," writes Parsons. "To put it very dramatically,… your first order of business is to break your heart for God. We walk through some muck so that we can leave it behind and find Easter joy beyond…. With God's help we will clear the darkness away and begin to experience greater joy and newness of life." Sure, there's work to be done during Lent, but it's the gentle, gradual work of opening one's heart and mind to grace. A Clearing Season will move you week by week from "wilderness to holy ground," using a personal tone that will stir and challenge personal reflection. Parsons includes exercises for small groups, as well as questions at the end of each chapter for individual reflection. 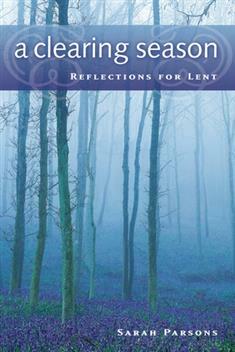 Also included is an appendix of spiritual practices for Lent. This Lent, clear away the obstacles that block you from God, and experience spiritual renewal.